Anywayz, about 1.5 year ago, I managed to find this as a poster from a forum link that I can't remember. I made the order and it reached my door pretty soon. 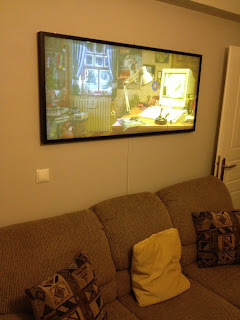 The poster was pretty wide (as the wallpaper is) at about 135x62cm and a custom frame was ordered in a nearby frame shop. 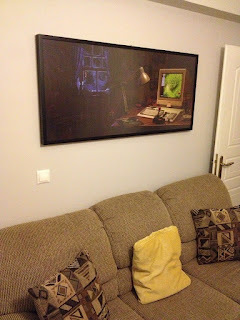 When I received the completed frame with poster and mat glass and everything was alright, I realized that despite I loved my newest frame... the picture was indeed very dark and details weren't visible. This wasn't nice for my taste and whatever effort I put into giving a little light to the frame had bad results so I had to do something more drastic!!! So... after searching around, I thought of putting LED strips behind the poster for it to get illuminated (like the posters of movies most times seen in Bus stops etc. Bad thing is that these are in rather thick frames with big fluorescent lamps installed. Rather easy stuff, but my case was indeed more challenging cause frame was thin enough having a large carton behind the poster to hold it together with the frame. As you can clearly see, the LEDS are clearly seen and the poster isn't showing at all. OK I knew that this was an example, but I had to do something more drastical. So... I ordered a Plexi-Glass that was milky white in order for light to be diffused better into the Plexi-Glass and then to the poster itself. This is how it looks attached to the back of the poster. Except from the milky Plexi-Glass, I ordered another piece of 3mm wooden backplate, in order to use this to mount the LED strips. Using the already mounted carton was a NO-NO for 3 reasons. 3. Using it on the back of the frame would have gave me a bit more of space for LEDS to be more far from the frame so still not so visible. It took A LOT OF TIME to measure EXACTLY the width at which the LED strips would be mounted in order to be ok (you can cut every 3 LEDS in every strip) and for all 20m of strip to be enough! After the bridging I had to build a custom PCB that would hold all the power lines from all 4x strips. (FYI, you can't bridge all 4x strips together in one line cause then after the first 2 strips the light on the other 2 is dimmed and looks crap! Different power per strip is the best). It was about time to test the strips, so I connected the PSU and powered up the backplate and VOILA! I went to the frame shop again next day and ordered another frame but this time it wasn't 1cm thick but 3.5cm+ wide. YEP, and this time was PERFECT!!! 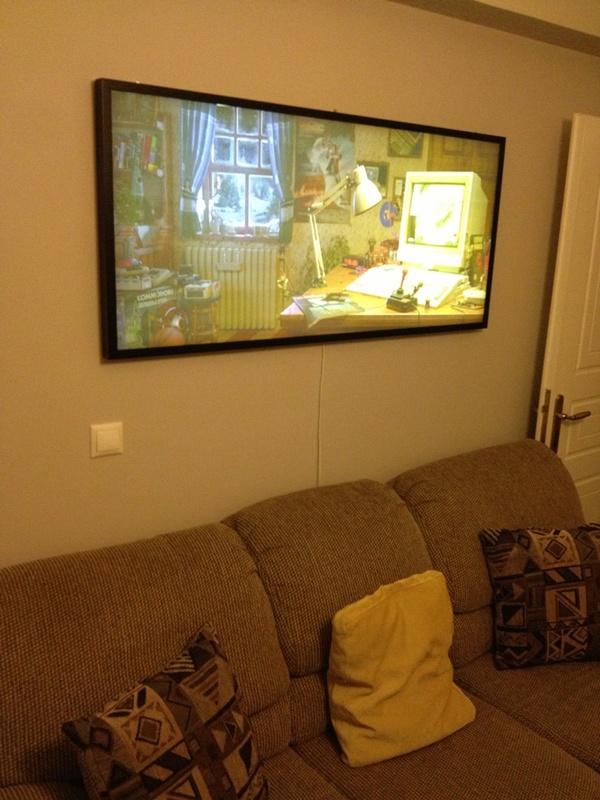 Sadly the images can't show how beautiful this frame looks with the backlight, and dont' forget you can dim it with the remote control if it's day or night according to your needs. (I need to cover the cable and paint it with wall's color but that is really minor atm). I hope you like this mod. It's not exactly Amiga hardware oriented but hey... At least it has an A500 with Cannon Fodder LOL. Awesome! Did you used the original or the one I modified with a CD32 instead the ST? Nice job with the poster - I also ordered it (Í was the one who asked the artist to put it up for sale on that site), and I was also not happy with the colors - so I complained to the site and they returned my money and let me keep the poster.